Formerly called SRGC, but too irregular for that name. Now this causes two tiny issues: On the one hand, a single signal can not compete with a giant building. On the other hand, you can't really show off transparency in an object by itself, you need to see how it looks in the game with other stuff behind it. Therefore, in this SIGC, your task is to create any number of objects that contain transparency, for any pak size and style, and show them through a game screenshot of any (but rather small) size. I will end this contest on April 17th, then the voting period starts. Create an image that fits the topic of the contest. In this case, a screenshot of one or several objects using transparency. Pick one: CC0, CC-BY 3.0 or newer, CC-BY-SA 3.0 or newer. Just a building with drop shadow. This is a bit elaborate: The red "STC"-Letters are a frontimage in lightcolor, which enables anti-aliasing. Click for full size so it can be seen. Hello. I was interested in this topic introduced on Simutrans community in Japan. If there are missing or wrong in in this textmn please tell me. 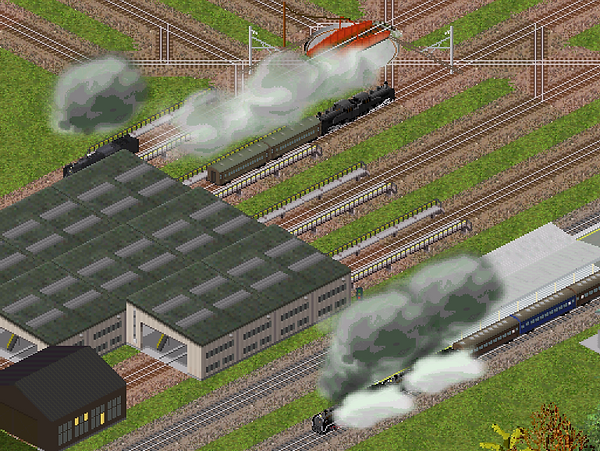 These locomotion have two invisible cars connected forward them and emitting two Different smoke that has transparency at the same time. I think good point of using transparency is two. First, smoke concentration decrease as the train speed up. Before 120.2, images of smoke are mass of smoke, but it looks straight in 120.2. Second, we can overlay different image of smoke. This "JHSDF_realsmoke" emit white smoke everytime, and emit black smoke and drain while train powering. Before 120.2, We have to make hole in graphic so that we can see both graphics of smoke. But I don't have to worry about it in 120.2. 2017.4.12 Uploader has downed so I changed address of image. I'ld love to keep this thread alive, such an interesting Topic. Technicly this should be pretty obviuos. The glas shares the grayscale of the stale structure but with different basis. Since i just have one frontimage i had to repaint the colored structure in the front, which is not affected by the glas Roof, but painted a bit darker then where no rrof is on top of it. Well, I'll get in too. With Clouds & Ballons. Here's a screen showing two of the 5 new semi-transparent Futurama inspired clouds. 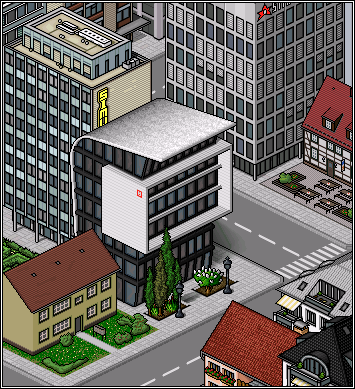 It also sports an updated The Transporter's Train Depot with glass windows. It also shows three of the 5 hot air balloons and the animated waterfall. The blue and the far left balloon were Photoshopped in the image just to show them. The transparent items are the catenary system, the light from the signals facing away from the camera, as well as some of the buildings. As the night falls on snow covered town, the streetlamps shed light on people rushing home from the last bus. Pak128.CS with some not yet released addons, not a real game, licence CC0. The streetlamps use transparent window light colours. The effect is best seen against snow background. Too bad it was never solved.